POTSDAM, Germany - Coatings manu- facturers are now able to monitor the production of paints, varnishes and adhesives continuously and in real time, allowing them to design more efficient processes, thanks to researchers from the Fraunhofer Institute for Applied Polymer Research IAP and the Potsdam- based company PDW Analytics GmbH. 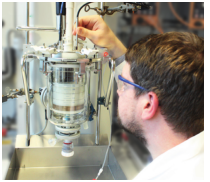 When developing new coatings, man- ufacturers want to know precisely what goes on in the reaction containers and how the sizes of the particles change during the process. Normally, manufac- turers take a sample of the coating, thin it down and analyze it. The properties of a coating can change during this time, and the act of thinning can also affect the sample. For instance, smaller par- ticles may clump together to form larger particles. Consequently, the particle size in the sample will not necessarily be the same as that in the reaction container. In the future this process will be simpler, quicker and more precise, as manufacturers will be able to analyze wall paints, varnishes or even adhesives inline. They will no longer need to take samples, but can analyze a product continuously and in real time directly during the manufacturing process. This is made possible by a new sensor that has been developed by the staff of PDW Analytics GmbH, and integrated by the researchers from the Fraunhofer Institute into their existing process development system. At the heart of this technology is a sensor based on photon density wave spectroscopy, a process developed by PDW Analytics. This sensor works by radiating laser light into the liquid wall paint via optical fibers. The intensity of the light is modulated up to the giga- hertz range. Next, the method analyzes how, depending on the frequency, the light propagates in the liquid. From these data the size of the individual particles is determined. The research- ers at the IAP have developed reference systems by using the photon density wave spectroscopy technique to mea- sure various samples with particles of a given size. IAP researchers use the sensor to reconstruct and analyze production processes for their customers. For some time now, the scientists have been working with a process development station that, in the case of suspensions with particle sizes of between one micrometer and one millimeter, enabled them to determine not only viscosity and heat flow but also the particle sizes. An infrared sensor additionally detected the chemical changes and showed to what extent the chemical reactions have advanced. Customers can opt to have their processes analyzed at the IAP, such as when a company is unable to resolve an issue by itself. Alternatively, because the whole system is transportable, they can use it on site at the company’s premises. Typi- cal questions are: Can polymerization time be reduced? How can uncertainties in the process be eliminated and material properties improved - for example, how to ensure that adhesives adhere better or wall paint covers better?